Michael Terauds was born in Middleton. Beginning swimming at a young age, he first swam competitively with the Greenwood Dolphins and then the Wolfville Tritons as he honed his swimming skills. At Middleton Regional High School Mike excelled in basketball, soccer, badminton and track and field. Later in high school swimming was becoming his main focus for sports. After graduating from MRHS in 1999 Mike enrolled at Dalhousie University and the Swim Team. 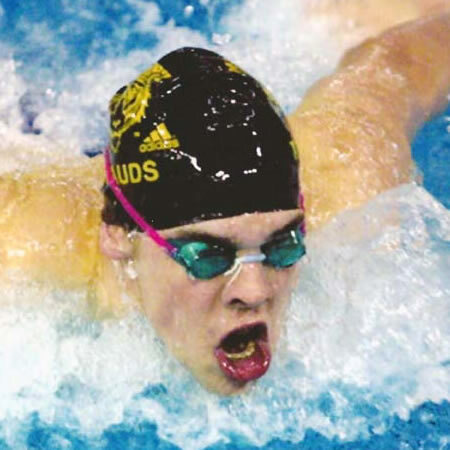 At Dal he became Captain and Swimming MVP for several years and a Climo nominee once for Male Athlete of the Year. Mike was a four time Atlantic University Sport Champion in the 200m butterfly and AUS Champion a number of times in the 100m butterfly, 100m and 200m freestyle and 200m individual medley. Over a span of five years he was a finalist and bronze medalist in numerous Canadian Intercollegiate Sports swimming events. In 2001 Mike competed for Team Nova Scotia along with brother, Matthew, at the Canada Summer Games with several top ten finishes. In 2003 at the Pan Am Games Trials Mike had some top six finishes, setting a Provincial record of 2:03 for the 200m butterfly (short course). At the Olympic Trials in 2004 he set a Provincial record of 2:05 for the 200m butterfly (long course). Also in 2004 Mike swam in both the Ultra Swim Grand Prix Series and at the SPEEDO World Cup stop in Edmonton. At the2005 Bermuda National Championships he was first in the 200m butterfly, 2nd in 100m freestyle and 3rd in 500m butterfly. Mike was a Provincial Carded Athlete (top ten in Canada) from 2000 to 2008. The Sports Heritage Wall of Fame is honored to welcome Michael Terauds as a most deserving inductee.